1 of 1 In small bowl, blend olive oil, lemon juice, zest, mustard, rosemary, garlic, salt and pepper. Rub pork with olive oil mixture. Place in a resealable plastic bag and refrigerate overnight. 1 of 3 Place cauliflower, squash, peppers and onion in a large bowl and toss with olive oil, garlic, lemon juice and rosemary. Place in a resealable plastic bag and refrigerate overnight. 2 of 3 Heat oven to 450 degrees . Brush large roasting pan with canola oil. Add pork. Arrange vegetables on a second large greased baking pan and season with salt and pepper. Place both pans in the oven and roast at 450 degrees for 15 minutes. Reduce heat to 400 degrees and continue roasting for 50 to 55 minutes or until pork's internal temperature registers 160 degrees on an instant-read thermometer. 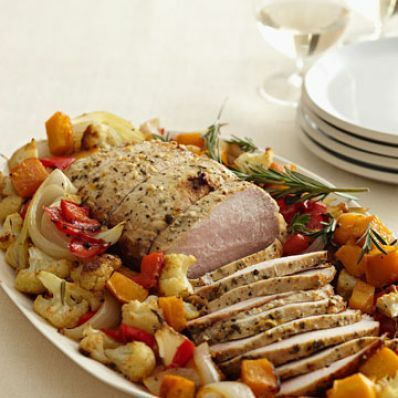 3 of 3 Thinly slice pork, place on platter and surround with vegetables. Per Serving: 446 mg sodium, 7 g fiber, 508 kcal cal., 6 g sat. fat, 104 mg chol., 26 g Fat, total, 24 g carb., 46 g pro.